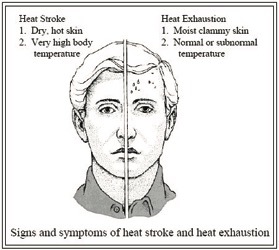 Objective: Describe symptoms of heat stroke and heat exhaustion, and explain emergency procedures for both. Provide copies of the OSHA Quick Card on Heat Stress shown below, available online from osha.gov/Publications/osha3154.pdf. Review the information below on heat exhaustion and heat stroke. Discuss measures to prevent heat stress and appropriate emergency procedures. Controlling heat stress is very important to pesticide workers and early entry workers. Early entry workers go into an area while entry is restricted after pesticide treatment and must wear protective gear. However, heat stress can affect anyone! Heat stress is a buildup of body heat caused either internally by muscle use or externally by the environment. Sometimes, the body is overwhelmed by heat. If so, heat exhaustion and heat stroke result. As the heat increases, body temperature and the heart rate rise painlessly. An increase in body temperature of 2 degrees Fahrenheit can affect mental functioning. A 5 degree Fahrenheit increase can result in serious illness or death. During hot weather, heat illness may be an underlying cause of other types of injuries, such as heart attacks, falls, and equipment incidents. The most serious heat-related illness is heat stroke. The symptoms are confusion, irrational behavior, convulsions, coma, and death. More than 20 percent of heat stroke victims die regardless of health or age. Younger workers seem to be more susceptible to heat stroke than adults. One side effect of heat stroke is heat sensitivity. In other words, once you have had a heat stroke, you are more sensitive to high temperatures for the rest of your life. Varying degrees of brain and kidney damage can also occur. Protect health — Heat illness is preventable and treatable before it is life threatening. Improve safety — Any heat stress can impair functioning. Increase productivity — People work slower and less efficiently when they are suffering from heat stress. Everyone has an essential role to play in preventing heat stress. Each member of the team should use good judgment to prevent heat-related illness. A heat stress control program should protect all workers. These workers range from those who can work comfortably in heat to those in poor physical shape. When possible, schedule heavy tasks and work requiring protective gear for cooler morning or evening hours. In prolonged, extremely hot temperatures, nonessential tasks should be postponed. Drink one glass of water every 15 to 30 minutes, depending on the heat and humidity. This is the best way to replace lost body fluid. Build up tolerance for working in the heat. Heat tolerance is normally built up over a one- to two-week time period. Take breaks to cool down. A 10- to 15-minute break every two hours is effective. Manage work activities. Match them to employees’ physical condition. Use special protective gear, such as cooling garments, headbands, and cooling vests on early entry workers. Know heat stress first-aid techniques. Keep the victim lying down with legs straight and elevated 8 to 12 inches. Move the victim to a cool place. Monitor temperature. Remove heavy clothing. Light clothing can be left in place. Cool the victim right away by any available means, such as placing ice packs at areas with abundant blood supply (neck, armpits, and groin). Wet towels or sheets are also effective. The cloths should be kept wet with cool water. To prevent hypothermia, continue cooling the victim until his/her temperature drops to 102 degrees Fahrenheit. Seek medical attention right away. All heat stroke victims need hospitalization. Most Personal Protection Equipment (PPE) limits sweat evaporation but not sweat production. Chemical resistant suits can cause rapid thirst if sweat is not replaced. To slow the buildup of heat when wearing PPE, use special cooling wear. If the temperature is above 70 F—Cooling vests may be useful when pesticide handlers are wearing chemical-resistant suits. They are either doing heavy or moderate work for a prolonged period. If the temperature is above 80 F—Working in chemical-resistant suits for more than a half hour without taking frequent water and rest breaks is unsafe. Cooling garments and frequent breaks are recommended. Breathing resistance is minimized, and the air stream has a cooling effect. Thus, powered air-purifying respirators and supplied-air respirators generally feel cooler than other types of respirators. Heat stress is serious. Heat stress should be handled as such. Exposure to heat can be serious to workers of all ages. Have plenty of liquids available. Administer first aid as needed.